The camel at the North Georgia Zoo nuzzled my neck. I like to think it was because he liked me, but let’s be honest, he thought there might be food in my teacup. No matter, I gave him a good-natured pat anyway and rubbed his nose. It was soft like a horses muzzle. I’d always heard about the North Georgia Zoo in Cleveland, Ga. – near Helen. I’d even met some of the zoo keepers while doing CBS Better Mornings Atlanta, so when the boy scouts announced they were taking an overnight trip to visit the animals and pitch a tent on property, I was glad to chaperone. The Zoo did not disappoint. Here are five reasons I’d go back. Unlike the Atlanta Zoo, where animals are away from the public in large enclosures, or Tanglewood Farms, where you’ll find miniature domestic animals, North Georgia Zoo is a bit like the Chesatee Wildlife Preserve with a wide variety of animals, and several ways to have a personal animal encounter. So if you are thinking where is a petting zoo near me? You might want to consider North Ga. Zoo. You won’t be able to pet all the animals, and I’d watch out for the llamas, they can spit, but the camel’s nose was soft, the parakeets landed all over us, and the wolves, surprisingly docile puppies. Our scout troop spent the night at one of the most unique zoos in Georgia. We pitched our tents next to the owner’s house, and had a covered picnic area to make and eat our dinner. Breakfast of cereals, fruit, and other treats were provided for us in the morning. We went on a guided flashlight wildlife walk hike through the zoo, met several of the animals close up, and howled with the wolves. It was more like hanging out with a cool aunt than an overly structured program too. The Great Pyrenees dogs that protect the animals at night did a good job of protecting us as well (at times a little too good). In the morning I enjoyed having the zoos near me, and the kids enjoyed playing in the field, and saying good morning to the camels, as well as plenty of other animals. My son, and several of the scouts LOVED parakeet landing. They simply couldn’t get enough. Perhaps it was the day we went, or maybe it’s like this all the time, but unlike the Parakeet Adventure at the Atlanta Zoo, the birds in North Ga. Zoo’s Parakeet Landing were all over us, sometimes 6 or 7 at a time. The boys loved it! I’ve already talked about the camels. Our overnight gave us lots of opportunity to interact with them, but even if you don’t stay overnight, you can take a wagon ride out and feed them. 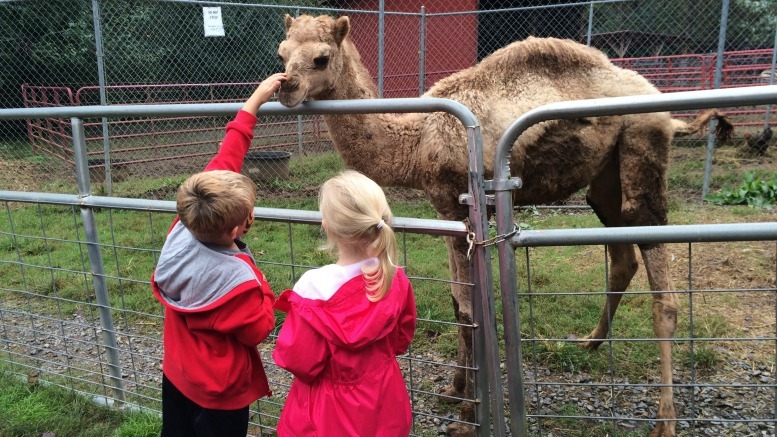 The wagon ride itself is fun, and of course, it’s not every day you get to feed a camel! It makes a good social media profile too. In addition to the more exotic animals, there are also plenty of native Georgia animals too. Set off on the side covered from the elements is a huge wool pit made from the sheared sheep wool. It was like discovering a hidden treasure. The kids stood on the hay bails and hurled themselves into the pit over and over. Did I mention these are city kids, obviously. If you can’t come to the North Georgia Zoo, let them bring the Zoo to You with a mobile petting zoo. The owners provide animals for the TV and movie industry in Georgia and are happy to bring educational programs, petting zoos and live nativities around the holidays directly to you. In fact they have so much experience bringing the Zoo to You, they have their own website – Wildlife Wonders. There is a base price for the zoo, plus add-ons, like the guided wildlife walks, and the camel encounter (or other encounters). There are lots of different pricing structures, and it confused me, even looking at it on the website and visiting. What I can say for sure is plan to spend more than the general admission. Once you are there, you’ll want to do one of the animal encounters, or purchase at least one of the feed options. There are a couple of ways to save money on a trip to the North Georgia Zoo. First, visit their website and sign up for the newsletter to save on your tickets. You’ll get a $5 coupon via email. You’ll also save money by purchasing your tickets online before you go. Next, pack a picnic lunch for the humans. There are picnic tables available. Bonus, now you’ll have some extra cash to feed the animals! Be the first to comment on "North Georgia Zoo: 5 Reasons to Visit and Save"